I feel like I owe an apology for letting my blog fall silent over the last two weeks. I took a week off for some much needed rest with my family. We escaped to the beaches of Puerto Pennasco, Mexico, where I had no cell coverage and internet coverage was nonexistent. Ahh…peace. My intent was to have a series of entries ready to post while I was gone. But as is my standard operating procedure, I ended up getting two weeks of work done in the week prior to my vacation. Unfortunately, my blog posts fell by the wayside. My recent experience of this cycle of intense work followed by a vacation free from work points to a natural rhythm that entrepreneurs can harness to their benefit. This pattern reflects the rhythm of work and rest that God modeled in the creation story of Genesis 1. God spent a period of creative activity followed by a time of Sabbath rest. For entrepreneurs, I think the great danger isn’t that they won’t work hard enough to succeed, but the danger that they will work so hard that their work product subtly begins to slide. They feel like additional time will create additional value when in fact there is a marginal decline in the value of the additional time at work. It’s the proverbial need to work smarter not harder. One of the great advantages to running your own enterprises is the ability to choose how and when to work…the chance to move from working by the clock to working for the accomplishment of specific measurable outcomes. It doesn’t matter when the work is done; it just matters whether the work is producing positive outcomes for the enterprise. My recent vacation reminds me that a rhythm of work followed by a time of rest can produce positive results in excess of just powering through endless weeks of work. The mere act of declaring a vacation free from work forces you to accomplish the important stuff before your departure. It also causes you to develop effective teams of co-workers who are capable of moving the business forward in your absence. There is much value in remembering that the business doesn’t succeed or fail only because of your efforts. Finally, I find that a vacation, free from work, restarts my creative nature, which is so important to my role as a leader. So, today, get out your calendar and schedule in time for rest. It doesn’t have to be a week long vacation. In fact, a weekly observance of Sabbath helps bring this rhythm into day-to-day life. Faith venture entrepreneurs need to remember the importance of focused activity followed by rest. What ignited your desire to start a new business venture or to make major changes to an existing business? What is your own biggest strength as an entrepreneur? What do you think are the top three skills required for a business entrepreneur? What skill of your own would you like to improve the most? What’s your favorite part of a normal day in your business? What daily task would you like to give up? What have been some of your biggest mistakes that you wish you could change? How did you fund or find investors for your start-up? Do you believe there is a formula for entrepreneurial success? What defines a good salesperson for your business? How does faith influence your business? What company do you admire the most besides your own? Have you ever worked with individuals rebuilding lives from addiction or felony conviction in your business? What do you see as the biggest challenges for working with such individuals? 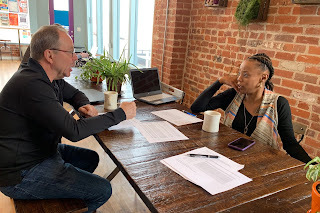 About four years ago, I set a bold goal for Belay Enterprises of creating 100 new faith venture businesses over the next five years through our urban micro-enterprise program. A few months after making that goal, it became apparent that I was out in front of God. There was no way Belay was going to assist in the creation of that many businesses during that time period because we had entered a period of unique challenges which would prevent a focus on expansion. At Belay, there is always a tension between focusing on expansion and focusing on the existing. 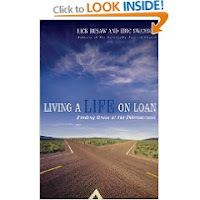 I found myself regretting that I shared my goal with my friend Eric Swanson because he included it in his book Living a Life on Loan. There was no escaping it. But now five years later, I realize the goal was an appropriate one. It was just my approach that needed a fix. A goal of creating 100 faith-venture businesses in five year is an excellent example of a James Collins’ type of “Big Hairy Audacious Goal.” It’s an idea that is so “out there” that it forces an organization to focus and innovate in order to achieve. As I now realize, 100 businesses in 5 year is impossible to accomplish as an organization that is centralized in vision. It takes decentralized leadership held together by a big vision to accomplish such a goal. At Belay, I had been guilty of trying to hold on to the model. In the future, we will achieve our mission by giving our model away. Over the years, I have come to see that there are much more talented entrepreneurs in the Christian community outside of Belay Enterprises. If we can share our faith venture vision for business enterprises that employ individuals and communities rebuilding lives by releasing our model, these talented entrepreneurs can build many more improved faith venture businesses. This will create more opportunities for the disadvantaged communities Belay seeks to serve. I hope that a decentralized movement of faith venture entrepreneurs will achieve the 100 business goal over the next 5 years. But a key teaching of the Genesis creation story is the idea of man being created in God’s image. As an image-bearer of God, man shares God’s inherent affinity for creative work. This trait becomes damaged as a result of sin entering the world. In Genesis 3:17, work’s creative goodness takes on a component of toil because of man’s original sin. Work is no longer known only by its creative aspects but also by its frustrating and difficult tendencies. One doesn’t have to look very hard to see how sin frustrates work and even contributes to its absence for large communities of men and women. Even though work has good, creative aspects for all individuals, some people find it difficult to find employment because of issues like poverty, addiction, or felony conviction. As a result, those very challenges become self-perpetuating realities because of an inability to support one-self through employment. With the reality of the two natures of work--its creative necessity and its frustrating nature—there is an important role for faith venture employment ministries in today’s world. Organizations like Belay Enterprises and other business as ministries can step into an area where the market fails the needs of individuals. For a person rebuilding a life from a felony conviction or homelessness, a job can be the first step towards future success and realizing God’s creative designs for an individual’s life. In Denver, we are experiencing a business anxiety recession in the midst of a relatively strong economy. Everyone seems panicked about the future. All day long I am dealing with individuals and business people fearful about the future. A friend of mine made an observation that we are scaring ourselves into a recession. We’re in danger of becoming like deer frozen in the headlights of an oncoming car. Collectively as a culture, we need to rediscover our inner drive to overcome problems and tough times. These were strengths of Americans in bygone eras. I sensed we were in trouble a few years ago when pundits were declaring the end of the business cycle. The reality is that economies have built into them the seeds of their own creative destruction. Economies go up and they go down. And there are opportunities to be found in both directions. I’ve chosen to turn off the news and focus on the fundamentals: God, family, serving our customers and clients to the best of our abilities. If it falls apart at some point in the future, we will pick ourselves up and try again, firm in the knowledge that God will provide a way. The future is uncertain…but then isn’t it always? As an entrepreneur, the question comes down to whether you have confidence in yourself to overcome future challenges. Every business plan will face challenges. The key to success, in Army parlance, is adapting and overcoming. Non-profits need self-sustaining models. Last week, I participated in a meeting of Christian ministry professionals. I had an opportunity to share about how Belay’s non-profit model is built upon self-sustaining businesses that do ministry. I forget how very unique it is to have a nonprofit organization that obtains most of its resources without having to rely on financial donations. I walked away from the meeting firm in my conviction that operating businesses isn’t the answer to most non-profits, but that non-profits need to think differently about raising money. Most non-profits act as intermediaries allowing individual donors to buy services for in-need communities or causes. Non-profits need to focus on finding investors that can build product delivery of non-profit services in a way that continually improves quality thereby building increased resources through efficiency and passionate donors. That is a non-profit equivalent to a self-sustaining business. I will explore this more in the future. For individuals rebuilding lives in our Bud’s Warehouse and Baby Bud’s programs, fear often sets in at the moment of success. This reality of self-sabotage was one of the biggest surprises to me at Belay Enterprises. When an individual nears graduation from our program and starts interviewing for jobs in the community, fear of the unknown and fear of success starts overshadowing possible positive outcomes. Running becomes an attractive option. Program participants sometimes break the law because consciously or subconsciously they are more comfortable with the consequences of bad choices instead of the results of success. A few weeks ago during a meeting of the Employment Committee of the City of Denver’s Road Home project, a staff member shared her “ah ha” moment related to a recent tour of Baby Bud’s. She said that across the many programs serving homelessness, people inevitable reach a point when they want to run. In her view, what faith-based organizations do so well is to create relationships that help overcome the flight response. She understood what lies at the core of all of our programs: the inherent nature of relationships. It is only through the support of circles of community and close one-on-one relationships that individuals can face their toughest challenges. These relationships mirror and reflect the even more important relationship with God. When these ingredients are in place, people rebuilding lives from addiction, homelessness of felony convictions are on a path of healing and wholeness.